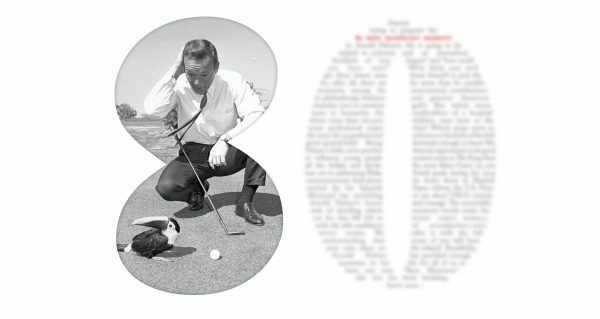 Anyone trying to pinpoint the 80 most significant moments in Arnold Palmer’s life is going to be subject to criticism and an immediate backlash of “you forgots” and “how could you leave outs?” We’re fairly sure we’d get these letters were Arnie himself to pick the 80; after all, there are far more than 80 notable moments among his monumental contributions to philanthropy, business and genuine American character (not to mention golf). But which mean more to humanity: the construction of a hospital where more than 100,000 children were born or the seven professional major wins? Which mean more to the man: the 92 professional victories or the birth of his first great-grandchild? Being fortunate enough to know Mr. Palmer a little, we’re positive that any opportunity to do good or influence young people matters more to The King than all the dollars and divots. So, sorry Skins Game ’92, you lose out to addressing Wake Forest grads during the 2005 commencement. And please sit down those in Madrid excited by his Spanish Open victory, the U.S. Navy Memorial has something to say about USCG veteran Arnold Palmer’s honor and courage. But which mean more to humanity: the construction of a hospital where more than 100,000 children were born or the seven professional major wins? Which mean more to the man: the 92 professional victories or the birth of his first great-grandchild? Being fortunate enough to know Mr. Palmer a little, we’re positive that any opportunity to do good or influence young people matters more to The King than all the dollars and divots. So, sorry Skins Game ’92, you lose out to addressing Wake Forest grads during the 2005 commencement. And please sit down those in Madrid excited by his Spanish Open victory, the U.S. Navy Memorial has something to say about USCG veteran Arnold Palmer’s honor and courage. Winifred Walzer Palmer, beloved first wife of Arnold Palmer, is born. Kathleen (Kit) Gawthrop Palmer, beloved second wife of Arnold Palmer is born. Palmer steps off a bus at Wake Forest, N.C., carrying a suitcase, a golf bag and a scholarship offer from golf coach Jim Weaver. Still reeling over the death of close friend and Wake Forest golf teammate Bud Worsham, Arnold Palmer enlists in the U.S. Coast Guard and reports for duty in Cape May, N.J.
Palmer wins low amateur in the 1954 Pennsylvania Open at the Hershey Country Club. Palmer wins the 54th U.S. Amateur Championship. Palmer turns pro and signs a 3-year endorsement deal with Wilson Sporting Goods that will pay him about $5,000 a year. Palmer, 25, and Winifred Walzer, 20, run away to “elope” in the Falls Church (Virginia) Presbyterian Church before a small circle of Palmer family and friends—and no Walzers. Palmer’s future father-in-law, Shube Walzer, boycotted because he was convinced his daughter was making a tragic mistake. Palmer wins his first professional tournament, the Canadian Open. The putter Palmer uses for his first victory is stolen from his unattended bag. It has never been found. Arnold and Winnie Palmer announce the birth of their first child, daughter Peg. Palmer begins taking flying lessons at the Latrobe airport that will one day bear his name. Palmer wins the first of three tournaments on what will be his most successful calendar date as a professional golfer. On July 29, he’ll win three tournaments in three decades in three different states for escalating first place prizes of $3,800 (1956), $11,000 (1963), and $20,050 (1971). Four days after overhearing Ben Hogan wonder aloud “how the hell Palmer got an invitation to the Masters,” Palmer wins the first of four green jackets. Arnold and Winnie Palmer announce the birth of their second child, daughter, Amy. Palmer shoots 66 to win the Bob Hope Desert Golf Classic in Palm Springs, California, and $12,000. It is the first of five wins there. Announcer Jim McKay’s excited chatter in the booth above the 18th green distracts Palmer as he’s about to strike the winning putt at the 1960 Masters. Palmer backs away, grins up at the now-sheepish McKay, readjusts and sinks the putt. Palmer embarks on his most memorable charge to secure perhaps his greatest victory. He begins the fourth round of the 1960 U.S. Open at Cherry Hills seven strokes behind leader Mike Souchak. Designer Oleg Cassini weighs in on Palmer: “He’s totally inelegant, a representative of the masses. If his pants fit, he wouldn’t have to hitch them up all the time.” Within six years, Palmer sportswear begins outselling Cassini. Palmer takes a 12 on No.9 at the Rancho Park Golf Course during the 1961 Los Angeles Open after blasting four straight balls OB. Club members install a plaque commemorating the deed. Palmer is awarded the coveted 1960 Sportsman of the Year by Sports Illustrated. Palmer secures the title he’s most eagerly sought, the British Open, beating Britain’s Dai Rees by a single shot in the wind and rain at Royal Birkdale. Palmer misses an 8-foot par putt on the 9th hole of the final round of the 1962 U.S. Open at Oakmont during a match that would have him three-putting 13 times over four days to eventual winner Jack Nicklaus’s one three-putt. Years later, Palmer cited the missed putt on 9 as the one he’d most like to mulligan. Palmer is at his most dominant as he cruises to a fourth Masters victory, finishing 6 shots ahead of Dave Marr and Jack Nicklaus. It is the last of his seven major professional victories. Palmer flies his new Jet Commander to New York for wife Winnie’s birthday, then receives the Gold Tee Award at the Metropolitan Golf Writer’s Association. Palmer takes a seven-stroke lead to the tenth of the U.S. Open at Olympic Country Club’s Lakeside course. In one of golf’s greatest collapses, Palmer shoots a four-over par 39 on the back nine while Billy Casper’s 32 forces a Monday playoff, which Palmer loses. Palmer wins $2,000 at the American Golf Classic at Firestone Country Club in Akron, Ohio. The sum makes him the first professional golfer in history to earn more than $1 million in career earnings. Golf Magazine takes a peek inside the guest book aboard Palmer’s Jet Commander. Recent passengers include former President Eisenhower, Bob Hope, Andy Williams, Dinah Shore, Dow Finsterwald, Vic Damone, Dave Marr, Doug Sanders, Bruce Devlin and more. The Palmers visit President Eisenhower at Walter Reed Hospital for coffee and heart-shaped cookies. It will be the last time the friends are together. Palmer breaks his own course record from September 23, 1968, with a 12-under par 60 at Latrobe CC. The round included three eagles, eight birdies, five pars and two bogies, one of them on the sixth hole, a reachable par 5. “I’m still kicking myself for that bogey at six,” he says 40 years later. Palmer ends a year-long slump by winning the inaugural Heritage Golf Classic in Hilton Head, S.C., Thanksgiving weekend. One week after winning at Hilton Head, Palmer launches a vaunted charge to win the Danny Thomas Diplomat Classic. The Associated Press announces Palmer is the Athlete of the Decade, beating out future hall of famers Bill Russell, Sandy Koufax, Johnny Unitas, Mickey Mantle, Willie Mays and Jim Brown. From now on, it’s Dr. Palmer after Wake Forest presents the golfer with an honorary doctorate of laws degree. Palmer wins the Westchester Golf Classic in Harrison, N.Y. and gets a congratulatory call from President Nixon. Arnie and Winnie Palmer become the sole stockholders of Latrobe Country Club, the course where he grew up and learned how to play golf. Palmer beats Jack Nicklaus and a crowded field of challengers to win The Bob Hope Classic. At 43, it is Palmer’s first win in 18 months and will be his last on the PGA Tour. Palmer shoots a disappointing final round 72 to finish fourth at the U.S. Open at Oakmont. The bitterness of the loss is soothed by the fact that winner Johnny Miller shoots a record 63. Palmer, while at a Bay Hill Christmas party, smokes his last cigarette. Deacon Palmer plays 27 holes in the warm sunshine at Bay Hill Club while his son Arnold shoots a 64 at the Bob Hope Desert Classic. Later, Deacon Palmer is found dead in his room of a heart attack. His son often hints that it’s a way he wouldn’t mind going. Palmer navigates what some reporters call the greatest water hazards of his career as he circumnavigates the globe in a Lear 36 in less than 58 hours, a world aviation record that earns headlines around the world. Jimmy Carter is inaugurated as the 39th president of the United States, replacing Gerald Ford, who in his first act as a private citizen flies a chartered jet to Pebble Beach Golf Course to play golf with Arnold Palmer in the Crosby Celebrity Pro-Am. Palmer uses an 8 iron on the 144-yard sixth hole at Indian Wells Country Club during the 1980 Bob Hope Desert Classic to score his 10th career ace. Palmer wins the USGA Senior Open at the South Course at Oakland Hills C.C., Bloomfield Hills, Michigan. Crowds gather in hopes of seeing Palmer ace the same hole three consecutive days at the 1986 Chrysler Cup Pro-Am. Alas, Palmer’s shot goes into the rough. A third consecutive Palmer one-putt eagle on the par 5 16th punctuates a final round 68 at the Union Mutual Seniors Golf Classic at the Purpoodock Club in Maine. Arnold Palmer aces the 122-yard second hole at Latrobe Country Club for the third time. Also on this day exactly 32 years previous, he’d aced during an exhibition in Johnson City, Tennessee. The Los Angeles Times reports that Arnold Palmer remains No. 1 in the endorsement field. The paper reports Palmer will earn $8 million in endorsements this year. Palmer, 59, shoots a final round 70 to win the Crestar Classic at Hermitage Country Club near Richmond, Virginia, and the $48,750 first place prize. It is his 10th win since turning 50 and his final professional victory. President Clinton presents Palmer with The National Sports Award at a gala banquet in Washington. Palmer breaks personal precedent and charges a fee for his autograph. Told that business at his grandchildren’s 18th hole lemonade stand is slow, Palmer takes time out from his hosting duties at Bay Hill and agrees to sign autographs for anyone who’ll buy a $1.50 glass of lemonade. Thirty minutes later, the stand closes after taking in $50 and running dry of lemonade. Palmer becomes the key early investor in what will become a wildly successful and lucrative cable network, Golf Channel. Arnold Palmer, the sentimental favorite, misses the cut at the 1994 U.S. Open at Oakmont, but stirs many in the hometown crowd to tears as he makes his final appearance in a U.S. Open. Augusta National honors Palmer by dedicating a plaque to him next to a newly constructed water fountain near the 16th tee. The four-time Masters champ was only the fourth player ever so honored. Palmer, 65, crosses the Swilcan Burn at St. Andrews for the last time as a professional competitor. The K Club, future site of the 2006 Ryder Cup championship, opens with Palmer and his design team on hand for the festivities. The 100,000 birth is recorded at the Arnold Palmer Hospital for Children. Ground is broken for the Winnie Palmer Hospital for Women & Babies in Orlando. Newspapers report how Palmer and Yankees manager Joe Torre were on a Hawaiian whale-watching cruise when Palmer shamed Torre, then 64, out of thoughts of retiring. “He said, ‘Hey, I’m 74 and I’m never going to retire,’” as Torre recalled Palmer’s scold. Palmer aces the 208-yard 17th hole at Bay Hill Club for his 19th and most recent ace. President George W. Bush bestows Arnold Palmer with a Presidential Medal of Freedom Award, making Palmer one of just roughly 400 ever to receive the honor bestowed to distinguished Americans in peacetime. Arnold Palmer and Kathleen (Kit) Gawthrop, are married on this day in a private ceremony by the sea at Turtle Bay Resort, Kahuku, Oahu, Hawaii. While giving the commencement address during graduation ceremonies at Wake Forest University, Palmer tells students to find role models who elevate their games and their fellow man. She’s played with Bruce Springsteen, he’s played with Jack Nicklaus; but today Melissa Etheridge and Arnold Palmer share the stage in Philadelphia to offer hope and inspiration to cancer survivors like themselves. Wake Forest alum Arnold Palmer and Louisville native Muhammad Ali serve as honorary captains for their teams at the Orange Bowl in Miami. Louisville Cardinals win 24-13. Arnold Palmer returns to The Masters to hit the honorary first tee shot. Palmer and Kit are among 130 A-list guests at a White House dinner honoring Queen Elizabeth II. Following the elegant White House dinner, Palmer accepts an invitation of U.S. Supreme Court Justice Anthony Kennedy, a friend of Kit Palmer’s, to visit the highest court in the land. The U.S.G.A. dedicates the Arnold Palmer Center for Golf History in Far Hills, N.J. “This is a major championship to me,” Palmer says. The House of Representatives unanimously passes legislation introduced by Congressman Joe Baca (D-Rialto) to award Arnold Palmer with the Congressional Gold Medal. Arnold Palmer flies his Citation X from Nashville to Dallas to take part in an HP Byron Nelson Championship luncheon ceremony where he receives the Byron Nelson Prize and a $100,000 contribution to a charity of his choice.